As usual Salesforce stuff, we have label and name (read API name) for an object, field, dashboard, and etc. But, is there such things in the Einstein Analytics for the dashboard? Yes, there is, although you do not always need to know the API name, however, in some scenario, you need to know. When you edit a dashboard, you only change the title, same goes to the lens. Let looks at dashboard JSON, the second line of the dashboard will say "label": "dashboard name", we can easily change the label, but can we get the dashboard API name? Scenario: I create a dashboard called "backup map", by default the API name would be backup_map, this is just by replacing space with _. After a while, I change the label from "backup map" to "my map", will the API name change from backup_map to my_map? The answer is No. 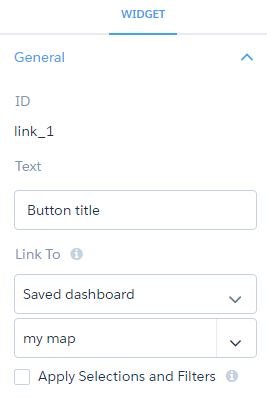 Create a new dashboard, add link widget and select link to Saved dashboard, and select the dashboard you would like to check. Workbench is a powerful tool, love by all Salesforce developer and admin, also for us as Einstein Analytics power user. 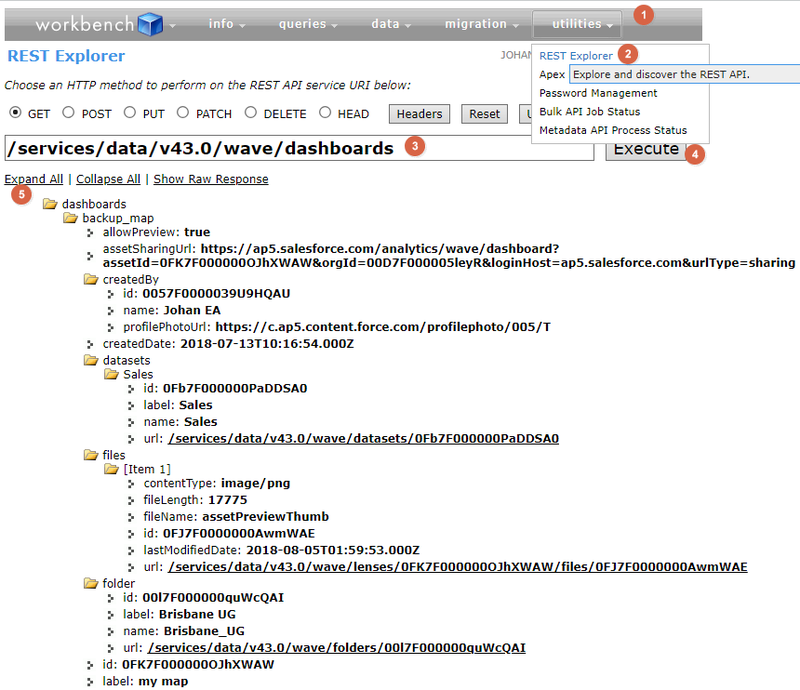 Once you login to Workbench, navigate to utilities - REST Explorer, change the URI to /services/data/v43.0/wave/dashboards then click Execute button, then click Expand All link. Here, you will find everything you need to know about your dashboards. From the screenshot below, the API name is "backup_map", while the label has been changed to "my map".